Nuun Active Hydration electrolyte replacement tablets offer athletes a unique carbohydrate-free fluid replacement. For athletes who prefer a non-sugary sports drink that contains only the electrolytes you need to replace, without the calories, sugar, or carbs of other sports drinks, nuun may be the best choice. Drop one nuun tablet into a standard-sized water bottle and you will replace the key electrolytes without the calories of most other sports drinks. You may prefer nuun to other sports drinks on the days that you exercise at a moderate or high intensity for an hour or two. You may not want or need to add as many carbs or sugar as are in the typical sports drink, but you should replace electrolytes, particularly if it's hot and humid and you are sweating quite a bit. Sports drinks can be a bit too sugary sweet you may prefer to decide when and what calories you consume during training or racing. You may want to eat your calories during a long-distance bike ride and wash them down with some nuun rather than have a completely liquid diet of another sugary sports drink. Nuun tablets provide a light flavor and no sugar. That makes it work well in plastic water bottles or hydration packs because it rinses clean and doesn't build up a sticky residue in the bottles. The American College of Sports Medicine recommends that athletes replace sweat losses with fluids during activity. But, because individual sweat rates vary so much, it's hard to recommend a specific amount of sodium or other electrolytes. They do say that an athlete with an average sweat rate of one liter per hour can lose approximately 2 to 10 grams of sodium in a two-hour practice. In order to avoid hyponatremia, replacing lost sodium is also recommended. They encourage athletes to recognize their individual needs based on their own diet and sweat losses. Nuun provides 700 mg of sodium per liter (as two tablets are suggested per liter) so it will meet this need for the average exerciser over a long workout. Because nuun doesn't contain much carbohydrate, which slows the rate of stomach emptying, it is absorbed faster into the body than sports drinks with added carbohydrate. Keep in mind that people who are active for more than 90 minutes may also need to replace depleted carbohydrates (glycogen stores), which could result in 'the dreaded bonk, or "hitting the wall" during exercise. Taking nuun alone won't meet this need—you'll still require adequate calories to fuel your working muscles. Also be aware if you are on a low-sodium diet that you may need to check with your physician before adding nuun to your diet. Nuun is light and refreshing. None of the flavors are too heavy or sweet, and compared to traditional carbohydrate-loaded drinks, nuun is easy to drink no matter how long you've been exercising. 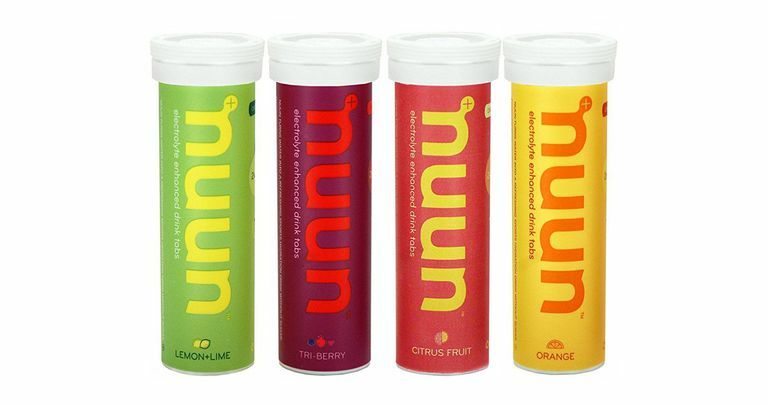 Besides the original lemon+lime, nuun offers citrus fruit, tri-berry, tropical fruit, watermelon, strawberry lemonade, orange, lime, grape, wild berry, mango orange, and cherry limeade. One tube contains 12 tablets and costs approximately $7.00 and you can generally get a discount when you buy in bulk. All in all, ​nuun is a great alternative to other calorie-loaded sports drinks. Simpson MR, Howard T. Selecting and Effectively Using Hydration for Fitness. American College of Sports Medicine. 2011.